[Grahamsville, N.Y.] – Time and the Valleys Museum on St. Rt. 55 in Grahamsville, Sullivan County, will be offering free admission to Museum visitors on Saturday, September 22nd and Sunday, September 23rd as a participant in the Smithsonian Institution’s Museum Day Program. Hosted by Smithsonian Magazine, on this 14th annual Museum Day, participating museums across the country offer free admission to anyone with a Museum Day Ticket. 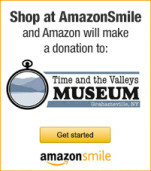 The Time and the Valleys Museum will grant free admission to all visitors who download a Museum Ticket from the Smithsonian’s website at Smithsonian.com/MuseumDay. Museum Day visitors will one of the first to enjoy the Museum’s new 1930s Lost Catskill Farm – a house, outhouse, milk house, electric plant, water wheel building and 1870s barn with interactive and engaging exhibits on farm life in the 1930s.